From the looks of it, there’s not much left in the debate as to whether the Leafs are good or not. It’s a pretty sure bet that they are, even after last night’s regulation loss to Philadelphia, their first regulation loss on the road in nearly two months. The debate now shifts to what to do with this team; do you let them slowly grow, or do you start trying to make waves as soon as possible? I’m a big believer in next year being the year you go for the Stanely Cup, thanks to the team’s Salary Cap flexibility and the fact that most of the recent mini-dynasties made their first push when their core stars weren’t much older than Leafs’ group now. But there may be something to even trying to make a half-push this year, to get a taste while planning ahead. One way to do that might be to talk to the Detroit Red Wings. The Red Wings are a tricky team to explain, in the sense that they seem to be in complete denial of what’s ahead of them. Dylan Larkin, Anthony Mantha, and Andreas Athanasiou all seem to be solid contributors to the team but are unlikely to come close to being the next foundation of the perpetual Red Wings dynasty. Mantha was even a bit of a shock this year; not to those skeptical of his talent, but to those wondering if all the public bus-tossings that the organization had involved him in would lead to his exit. After them, the cupboards are almost entirely bare, and their active roster is currently the fifth oldest in the NHL. Detroit hasn’t missed the playoffs since 1989/90, the third-longest streak in NHL history. But since losing to the Penguins in the 2009 Stanley Cup Finals, it feels like they’re spinning tires; they’ve won just three rounds in the past seven years, just barely squeaked into the postseason last year, and haven’t won a playoff series since the lockout-shortened 2012/13 season. This offseason, the team should have realistically let some air out of the tire to begin working on a rebuild, but instead traded down in the draft to offload departing forward Pavel Datsyuk’s contract, signed Danny DeKeyser, Luke Glendening, and Darren Helm to questionable huge extensions, signed soon to be 33-year-old Frans Nielsen to a six-year deal, and added a bunch of other depth signings to round out the roster. Much of this, of course, is because when they traded away Datsyuk, they figured they’d make a huge pitch to Steven Stamkos, which makes them the only real loser in that sweepstake given that they gave up a chance to draft Jakob Chychrun to get a “that’s nice” in a phone call. It was a shocking run of denial. Some of it worked out, though; Tomas Vanek was a spectacular depth signing at 1-year, $2.6 million, which will make him a great asset at the deadline. Except he doesn’t want to leave and there’s already talks of an extension, which sounds extremely Red Wings. It’s a mess. That team is spinning its tires in a snowstorm and they won’t take this rebuild seriously until the day they’re finally mathematically eliminated. Barring some extreme puck luck, that’ll probably happen this year; their 47.87% Score-Adjusted Corsi ranks 23rd in the league, their 0.500 record ranks 26th, and, well, Petr Mrazek can’t stop a beach ball at the moment. But that doesn’t mean that they won’t try to get out of this mess, so I propose that the Leafs play to their perceived weaknesses and get some things to solve theirs. 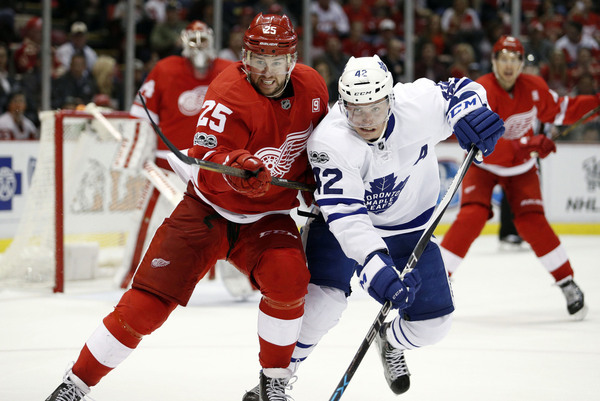 Specifically, I believe that the Leafs should at least kick tires on acquiring both Mike Green and Brendan Smith in a substantial deal with the Detroit Red Wings. Toronto’s perceived weakness right now is on defence; simply put, they give up a ton of shots on goal and there’s no conclusive opinion on the bottom four defencemen (Matt Hunwick, Roman Polak, Martin Marincin, and Frank Corrado) on their present roster. I’m a bit more skeptical that they have to get better at shutting down, and that the premium put on that “steady” player at the moment, is, quite frankly, ridiculous. That doesn’t mean that they can’t improve the players they have that play the position, though and that they can’t cater more to their strengths. Your first reaction to seeing those names was probably “how does that help them defensively”, to which my response is, in effect, “exactly”. Both Smith and Green are players who play in the “new” Leafs mold. They’re both smooth, highly mobile skaters who aren’t afraid to either initiate or hop into rushes, with green in particular being more of an offensive catalyst. While he’s no longer the point-per-game guy he was with the Washington Capitals seven years ago, Green is routinely a safe bet to contribute 40 or so points and adds yet another weapon to an already successful powerplay unit, giving them an option to shoot from the outside when the slot isn’t immediately available to them. Looking at their underlying numbers, you’ll find that both players have performed quite well both in terms of generating offence for their teams, even when they aren’t individually contributing it. They’ve also both become relatively solid at keeping the puck away from their own net, which is something that many fans are looking for out of the Leafs’ group, though they seem to be looking for people who do it a more “traditional” way (that, coincidentally, often doesn’t work). While Smith and Green haven’t spent too much time together this year, they were regular partners last season under Jeff Blashill. Together, they put up a 59.1% score-adjusted CF% over 400 minutes, the fourth-highest Detroit has had in the past decade from any regular pair in a single season. Their expected goals percentage of 55.7% was fifth in that stretch; in both cases, all but one of the pairs above them involved Nicklas Lidstrom and someone else (usually Brian Rafalski). The two have been mostly separated this year, but that comes as a combination of them getting individually injured and Jeff Blashill trying to give a couple of his weaker defencemen a bit of a boost, similar to what Mike Babcock did with Jake Gardiner last season. Both players also do just enough of the “narrative” stuff that they won’t get much of it thrown around at them. Both are middle-aged at 27 and 31, they’re 6’1 and 6’2 respectively, neither are particularly fearful of throwing a hit, blocking a shot, or in Smith’s case, occasionally dropping the gloves, though he’s not always the greatest at picking his spots. With all of this said, being good and being on the trade market are two separate things. In this situation, though, I don’t think it’s insane to think that the Wings would be open to moving either of them. Green has been great, but they’re aware that he’s not at kid age anymore, and that he’s the second-highest paid player on a team that needs LTIR to stay at the ceiling. As for Smith, he seems to have fallen out of favour in recent years; his style of play doesn’t mesh with the grit-and-grind, blue collar style that Blashill looks for out of his players. Babcock was skeptical at times of Smith’s fit while he was there too, which leaves questions as to whether he’d accept him on the Leafs roster, but the style and pace of play is different enough that I think a reunion wouldn’t be out of the question. What Detroit would want back is where the tricky. Smith is a pending UFA who wasn’t being used in vital situations and, to top it off, is still recovering from a knee injury, so I can’t imagine his return is super high. That works in Toronto’s benefit; particularly the UFA part, meaning he won’t take up a protection spot in the Expansion Draft. Green will, however, as he has one year remaining on his deal. Combine that with another decent season, and Detroit could probably easily get a first round pick and a sweetener if they decided to blow it up. But again, there’s that skepticism that they want to. With that in mind, maybe Toronto can get creative. Needing to likely protect Green means either risking Connor Carrick or protecting eight skaters instead of seven forwards and three defencemen. With this in mind, maybe it’s worth putting one of Tyler Bozak (who is riding a high in value at the moment and would have to be seen as more valuable than Riley Sheahan), Leo Komarov (Detroit loves forecheckers as much as they love entertaining Europeans, and he’s both), or Matt Martin (who they also tried to sign) into an offer. Maybe it’s worth putting both of Matt Hunwick and Roman Polak into the mix, since they’d be the pair being replaced, the Red Wings would need bodies, and with expiring deals, they could always re-flip them at the end of February. If they want prospects, names like Josh Leivo, Kerby Rychel, and Viktor Loov (who all need protection in theory) could be options, as could Andreas Johnsson, who fits the stereotypical “early 20’s Swede” mold of the Red Wings but hasn’t been the same since his concussion last spring. There’s also the vet trio of Milan Michalek, Colin Greening, and Brooks Laich below on the Marlies, but I don’t know how much value any of them have, if any. What would the right combination of all these pieces (and perhaps others) be to get a deal done? I don’t know. But that’s the direction I’d start with. There are a lot of players at Toronto’s disposal here that could be pitched to the Red Wings as being important to their way of playing the game, that could help them keep the streak alive (while also not being enough actually to do it without a miracle). They could pitch a move that they themselves would never do in Ken Holland’s shoes while knowing what Holland is prone to wanting in the past and what the greater team goal appears to be in the present. If that doesn’t work, and Detroit comes to their senses, it could also be worth giving up the sufficient level of supplementary prospects-picks while selling off a few of the aforementioned names to others to recuperate. At the end of the day, I’m relatively content with the idea of sticking to what the Leafs have for the rest of the season and focusing the team’s efforts into making bigger leaps forward in the summer. But winning is about maximizing strengths and values, and if pitched correctly, there may be an opportunity here to make a cost effective and strength-encouraging upgrade to an entire defensive pair. Having three duos at the team’s disposal who can skate, cycle, pass, and contribute to a strong forward core seems like the way to go, and if Detroit really is going for it and the market really only cares about the defensive side of being a defencemen, this might be the most efficient and fastest way to make that leap forward. As usual the voice of reason, lets just see what happens here, Toronto has made knee jerk moves in the past that led to failure. Detroit should have just kept the Datsyuk contract for a year and drafted Jacob Chycrun. They’d be so much better off that way.